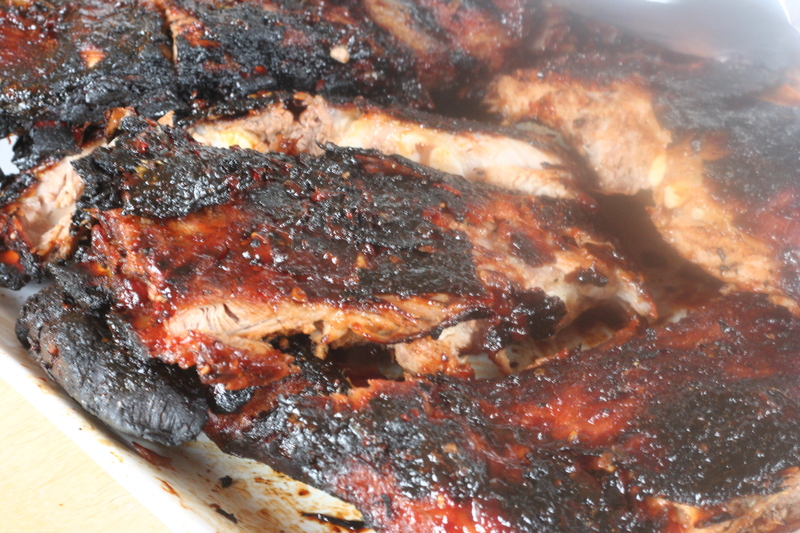 We enjoyed these ribs yesterday for Father's Day! I wish I could take credit for this delicious sauce - it was fabulous! I found the recipe on Food Network. I did change the cooking instructions to start with baking - I think it makes ribs more tender and you still have the wonderful grilled flavor from finishing on the grill. I would probably make these with baby backs next time...and there will be a next time! As I note, I did not use an entire can of chipotles - add them until you reach your desired heat level. In a food processor, combine honey, ketchup, ginger, and 5 chipotles with adobo sauce. Blend until smooth. Taste and add remaining chipotles, or more honey, if desired. If sauce is too thick, thin with a little water or apple juice. Pour half of the sauce over the pork and reserve the rest. Marinate for at least 4 and up to 24 hours. Bake at 300 degrees for 2-3 hours. Prepare a grill or grill pan. Grill the pork ribs until cooked to desired doneness. Some charring on the pork is delicious. Brush with some of the reserved sauce. Remove pork from heat and slather with remaining sauce or serve sauce alongside.